The Level 7 Diploma in Human Resource Management has been developed to produce graduates with skills to understand the management of human resources, aligned with good strategic decision making, to maintain organisations’ competitive advantage. To achieve this, learners acquire knowledge through an integrated approach of theory in human resource management and practice using real-time activities. Successful completion of this diploma will enable learners to build on their strategic human resource management and leadership skills and to focus on the requirements of implementing an organisation’s strategy. 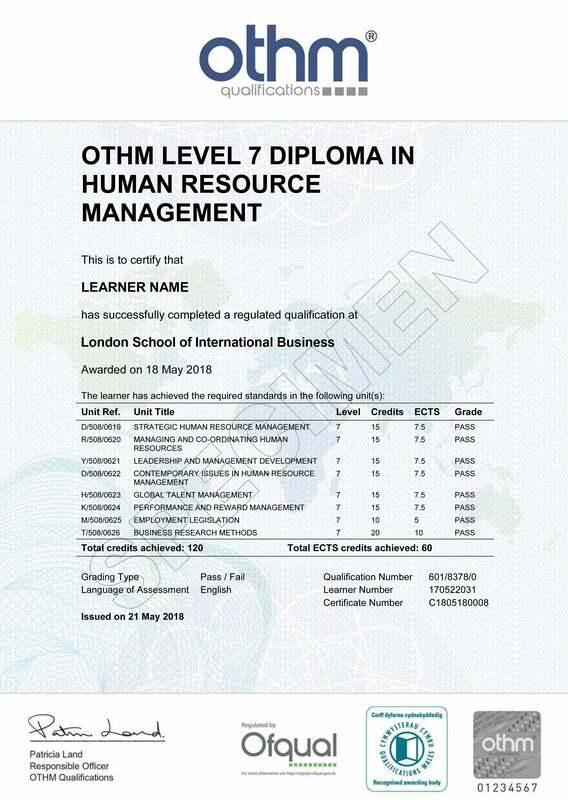 The objective of Level 7 Diploma in Human Resource Management qualification is to provide learners with the skills and understanding in human resource management (HRM) that align with good strategic decision making to maintain organisations’ competitive advantage. This qualifications at RQF Level 7 represent practical knowledge, skills, capabilities and competences that are assessed in academic terms as being equivalent to Masters Degrees, Integrated Masters Degrees, Postgraduate Diplomas, Postgraduate Certificate in Education (PGCE) and Postgraduate Certificates. ● To improve the employability of learners by allowing them to explore the relationship between theories and their practical application in the business world. The Level 7 Diploma in Human Resource Management qualification consists of 8 mandatory units for a combined total of 120 credits.